Don’t want to spend a fortune on a branded MP3 players like the Apple iPod? No problem. There are plenty of affordable options for budget consumers to choose from. Branded MP3 players can cost close to or over a $100. However, you can find similar music players for significantly less. The only difference is the brand recognition. Consider, for example, the best cheap MP3 player I found, Sandisk Clip Jam Mp3 Player. It performs similarly to the expensive ones. Overall, if you are looking for a budget MP3 device, there’s no reason to shell out anything more than $50. So if that’s what you’re looking for, this list is for you. 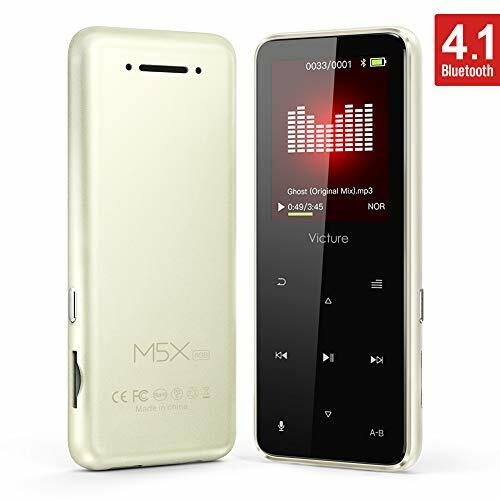 One of the greatest things about this mp3 player is that despite the low cost, it boasts an excellent design. It looks high end and you will great about carrying it everywhere with you. It also has some fairly high tech features. For instance, this player has Bluetooth features which allows you to listen to your music either through wired or wireless headphones. However, you do need to be prepared for connectivity issues on occasion. The sound quality is also impressive since the player is equipped with an ultra-low distortion, ultra-low noise chip. To add to this, the player also supports quite a few audio formats including mp3, WAV, APE, FLAC, and WMA. The mp3 player allows you to store up to 8GB of music on its internal storage. If you want to add more, you can add external memory of up to 64GB. Another that you will be pleased to learn is that the battery life on this mp3 player is great. After charging it for less than 2 hours, you can have wired playback for 45 hours and wireless playback up to 16 hours! In addition to the music features, there are also quite a few additions on this player. So, you can listen to the radio, use the pedometer, record sounds, and a lot more. This is yet another mp3 player that knocks it out of the park in terms of quality. Once again, this is due to the fact that you can experience lossless quality of music. This means that you can enjoy all of your favorite songs, in their original condition, without the sound being diluted at all. Furthermore, this mp3 accepts a wide variety of formats – ACELP, FLAC, AAC-LC, WMA, APE, WAV, and OGG. Therefore, you can download music from your favorite sources. The other perk with this device is that the playback time is incredible. You can listen to music for around 70 hours without needing to charge it. Even then, you will find that it takes just 3 to 4 hours to get it fully charged back up again. Just as impressive is that the built-in memory of the device is 8GB but this can be easily increased to around 128GB, with the use of a Micro SD card. This device does more than just play your songs. It also has a radio function, e-book reader, and voice recording feature. As far as user-friendliness goes, there is no denying that it is fairly simple to add songs to the player’s library. However, there are some issues with navigation, particularly when it comes to adjusting the volume. 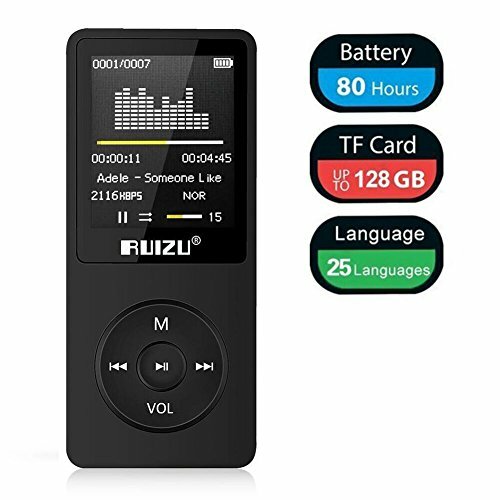 This is a great device for anyone who is looking for an mp3 player that they can take with them anywhere that they go. One of the reasons for this is the fact that the device is Bluetooth enabled, allowing you to use with Bluetooth headphones and speakers. To top it off, this player has been designed to connect with Bluetooth earphones more quickly, cutting down on the overall power consumption. The sound quality is also excellent as it boasts hi-fi lossless features. To add to this, the player is equipped to be compatible with different formats like WAV, WMA, FLAC, and APE. There are plenty of other features to enjoy with this mp3 player, apart from just the music. The device has an e-book reader, voice recorder, radio, photo browsing, and video play. If you are someone with a large music collection, then you will be happy to know that the mp3 player has 16GB of built-in memory. In case this isn’t enough, the memory can be extended up to 128GB with the help of an external TF card. As far as the battery goes, you can use the player up to 30 hours and then only need to charge it for about 2.5 hours. There aren’t too many complaints regarding this device except for the buttons. These are rather sensitive and even the slightest movement can alter the settings on the controls. This mp3 player is small and lightweight, making the perfect companion on trips to the gym or anywhere else, really. Despite its small size, though, it still provides you with a high quality of sound. This is because it comes equipped with a digital noise reduction chip that results in a high sampling rate. Not only is the sound quality top-notch, but the player is also compatible with various formats such as FLAC, WAV, WMA, and APE. You can also, essentially, store as many songs as you want on this. With a built-in 8GB storage, you can have up to 2000 songs on the device. Of course, you can extend this with an external memory card and bump the storage up to around 128GB. There is also a radio function. To make this an even more appealing device, you should know that it boasts around 80 hours of playback. And, within 2 to 3 hours of charging, it will be fully charged once more. The minor issue is that the controls aren’t very user-friendly and it can take some time to figure out how to work them intuitively. 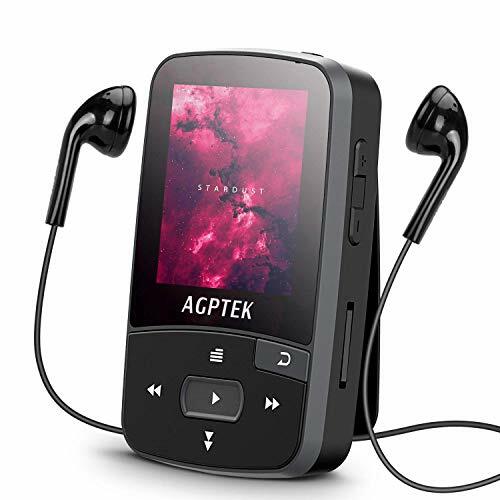 If you enjoy listening to music while you are running or working out, then this mp3 player will be perfect for you. For one thing it is small and compact and is light enough to carry around with you. For another, it is equipped with a clip that allows you to pin it to your clothes. Since has Bluetooth features, you can also sync it to wireless headphones while working out. The downside with the size is that the screen is quite small as a result. So, it can be tricky for some people to see all of the details. The other perk is that mp3 player supports a wide variety of audio formats including mp3, WMA, FLAC, and lots more. Due to this, you can be quite certain that your listening experience will be high quality and crystal clear. The mp3 player also boasts an internal capacity of 16GB which means that you get to store a large number of songs. In case that’s not enough, though, the device is also equipped to take on a Micro SD card of up to 128GB of expandable storage. The battery life is also excellent and you can expect up to 30 hours of wired playback and 6 hours of Bluetooth playback with just 1.5 hours of charge. 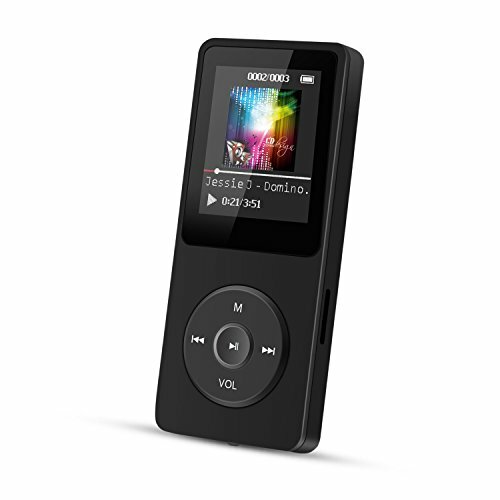 There are a number of low-cost devices in the market that essentially clone the iPod Nano model. Though most of these look like iPods, they don’t work the same. Notably, video quality takes a hit. However, audio quality is essentially the same so these products are worth buying if you care more about audio than video. Don’t bother about buying the latest model. New MP3 players don’t exactly come with hip new features. Unless a special feature found nowhere else is specified, don’t worry about what year the player was released in. Try to buy a player that comes with headphones. The audio quality will largely depend on the headphones you use with the player. Buy a product that supports the file formats that you need. For example, if you buy music from iTunes, you will need a player that supports AAC files in addition to MP3 files. It’s recommended to buy a player that supports a range of file formats. How do you feel about the Sandisk Sansa – http://amzn.to/2qrugZZ ? It’s not perfect but it’s the closest to an alternative.